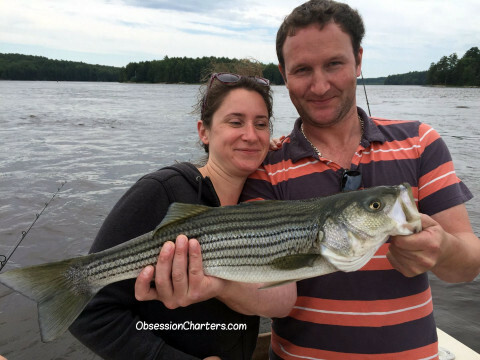 Ron and Karen Banas from PA enjoying a nice (albeit windy) day of striped bass fishing on the Kennebec river. 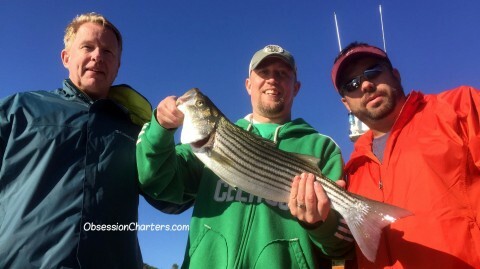 Longtime client John Kern from Salt Lake City joined me Saturday on the Kennebec for a morning of striped bass fly fishing. We had a dropping tide as we left the marina at 5:30am. As we rounded Thorne Head the gulls were diving on bait, a sure sign the stripers were on the ledge. First drift through the gulls provided a solid hookup. Steve Wrigley and his son had a great morning on the Kennebec. 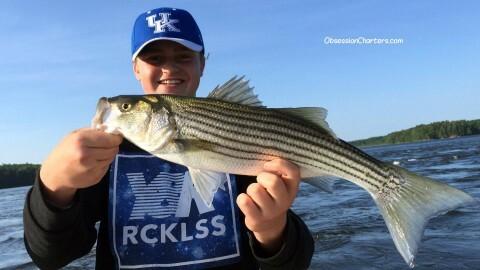 They caught a ton of schoolie stripers and some good ones too. We were fishing the rips on an incoming tide. 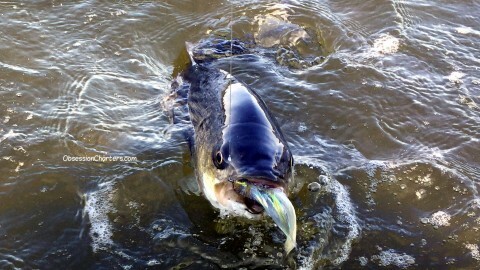 Bait was being driven to the surface and gulls were diving while tons of stripers stacked up on the ledges. Caught most of them spin fishing with white bucktails fished slow. Great meeting you guys! Safe travels home and I hope to see you again! 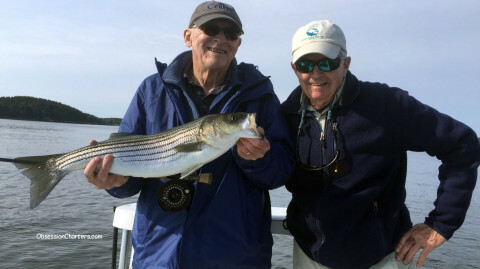 Dr. Matt Budd (81) a long time client catching schoolie striped bass in the rips of the Kennebec River using a 9wt Helios2 and a 350gr Depthcharge line. The fish were holding on a ledge in 15' of water and feeding on 2" alewives.